Jeremy Clements Racing to partner with Western Wishes and Tuff Hedeman to ride the RepairableVehicles.com #51 machine to the front at Texas Motor Speedway. FORT WORTH, Texas – (March 26, 2019) – Celebrating the 25th Anniversary of Western Wishes, 4-Time World Champion and Pro Rodeo Hall of Famer Tuff Hedeman announced today he has partnered with Jeremy Clements Racing (JCR) to offer a "short pit" for 11-year-old Kaleb Dorr on Saturday, March 30 at the Texas Motor Speedway. Hedeman and Jeremy Clements have joined forces to give Kaleb Dorr the ride of his life, not on a bucking bull, but a trip around the track with NASCAR XFINITY Series driver Jeremy Clements. Kaleb Dorr and Mandy Schaff of Western Wishes will be headed with Tuff Hedeman to see Jeremy Clements drive the #51 at the Nascar XFinity Race Saturday March 30 atTexas Motor Speedway. “Thanks to my buddy Jeremy Clements will have the opportunity to introduce Kaleb to NASCAR in a way most kids just dream about. Jeremy and I know that through these experiences if we are lucky, we might just have the chance to ignite hope, and strength for Kaleb and just let him have a little fun before he faces the reality of his disease again," said Hedeman who granted Kaleb's wish of meeting him in 2017. On Saturday, March 30, the lead car for Kaleb’s trip to the Texas Motor Speedway will be JCR Car 51, and Jeremy Clements will be the center of Kaleb's trip to the track to meet and eat lunch with the JCR team, tours the car and garage. Clements has invited Kaleb and Hedeman to ride with him during the introduction lap, and then enjoy the race. Kaleb Dorr suffers from TAR, Thrombocytopenia Absent Radius Syndrome, a rare recessive genetic syndrome that causes a unique blood disorder and limb deformities. When you look at Kaleb, you don’t see a little boy with a handicap; you see a pint-sized cowboy that has defied all the odds. After enduring 12 surgeries (with more to come) and over 200 plasma transfusions, this cowboy’s positive outlook on life remains remarkable. He wants nothing more than to be a team roper and a calf roper when he grows up. Kaleb is happy, outgoing, and is the first one to tell you “it’ll be ok” when someone else is faced with adversity. 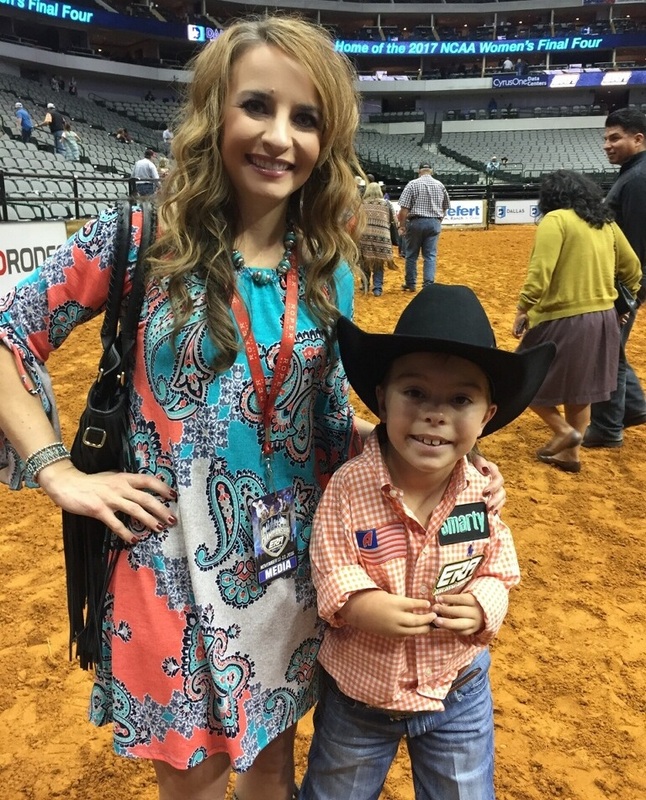 Since 1994, Tuff Hedeman and Donnalyn Quintanna, the founder of Western Wishes Charity, have been granting western style wishes to children faced with medical and sometimes just tragic life challenges. Through the help of dedicated professionals in rodeo and other walks of life, many celebrities including the late Luke Perry have dedicated their time and money to assisting Western Wishes. In 2014, an 8 Seconds Reunion Gala was held at Cheyenne Frontier Days with many including Luke Perry and Stephen Baldwin. Luke Perry, Tuff Hedeman, and Stephen Baldwin all celebrated Western Wishes Charity with an 8 Seconds Reunion Gala in 2014. “Man, we are really excited to have Kaleb ride along with us this weekend and, also help celebrate the 25th Anniversary of Western Wishes. Thanks to my buddy Tuff Hedeman and his group we get to give Kaleb a ride of his life this weekend.” Clements stated. “Western Wishes does an awesome job of turning dreams in to lasting memories and I can’t wait to meet Kaleb and his family and create more memories as we take our fast RepairableVehicles.com hot-rod to the front.” Clements went on to say. The day and week will be a dream come true for this special young man who will join Hedeman at the bull riding the following Saturday. It is not the first time the two pro athletes have joined forces. JCR #51 sported the Tuff Hedeman Tour logo during the NASCAR XFINITY Series in Las Vegas. The JCR team’s schedule overlapped up with THBRT in 2018, but this year the NASCAR XFINITY Series falls just one week before the legendary South Point Tuff Hedeman Bull Riding Challenge in the Fort Worth Stockyards Cowtown Coliseum. Kaleb and several Western Wishes recipients will be guests of Hedeman’s as THBRT participates and honors the 25th anniversary of the western-based charity. Hedeman together with 24 cowboy athletes, 3 bullfighters, and barrel man Cody Sosebee, will entertain and celebrate several Western Wishes recipients. Sonny Burgess, director of clinical performing arts at Cook Children’s Health Care System, the hospital in Fort Worth Hedeman frequents, discusses the impact of having Hedeman visit the children. Western Wishes specializes in granting wishes for challenged children who otherwise might not get to have experiences associated with the western lifestyle. The charitable organization has helped children of all ages attend western events from bull riding to rodeo to equestrian performance events. Western Wishes (westernwishes.org) a foundation created by Donalyn Quintanna, the former wife of the late PRCA World Champion bull rider, John Quintanna .Western Wishes contact: Donnalyn Quintana, www.westernwishes.org or donnalyn@westernwishes.org. The South Point Tuff Hedeman Challenge has become known for an action-packed three round bull riding performance that keeps fans on the edge of their seats. That is primarily due to the influence of four-time world champion and Pro Rodeo Hall of Famer, bull rider Tuff Hedeman who coordinates every element and attends to the smallest details. From having great bulls matched up with superstar riders, to upbeat music and enthusiastic fans, there is something for everyone.